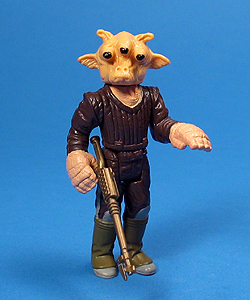 Major Variations: Though all vintage figures have minor variations, the Ree-Yees figure does have a major variation worth noting. This figure was moulded both with flesh coloured and brown coloured arms. Due to this moulding variation, the two versions went through different spray ops. The Flesh coloured arms had brown paint applied to the sleeves, while the Brown Moulded arms had “flesh” coloured paint applied to the hands. Subsequently, the legs also share a moulding colour variation, that to date appear to coincide with the arm variations. In all examples found, the legs on the Flesh Moulded arms figure were moulded in gray with brown spray ops. The Brown Moulded arms, on the other hand, all appear to be moulded in brown with gray spray ops. It is important to note that there is a chance that these variations could be mismatched, but as of yet, an example of such a thing has not surfaced. Thus far, all examples found of the Flesh Moulded arms version were produced in Taiwan, where the Brown Moulded arms all appear to have originated in Hong Kong. The Taiwanese version has also shown up with a spray op variation on the boots. In most cases the boots are painted green, but examples with light brown boots do turn up from time to time. Though subject to regional availability, the Light Brown boots version tends to be the more scarce of the two.